To say that Chef Julien Bompard enjoys an illustrious career would be an understatement - in addition to being the Executive Chef & Owner of Le Saint Julien Restaurant, the lauded chef was recently appointed the Chef Mentor of the Year 2011 as well as a knight of the order of agricultural merit by Minister Bruno Le Maire, the French Minister of Food, Agriculture & Fishing. Besides adding these titles to his growing hat of accolades, the honourable achievement also marks timely milestones in Chef Julien's quarter of a century's work in promoting French cuisine. In this one-night only DBS Masterclass With Chef Julien Bompard At AFC Cooking Studio, attendees got to watch the Chef in action & as well as sample the special ‘Le Saint Julien’, a Duo of Custard & Pan-seared Foie Gras. So let's create your own traditional French cuisine to impress your guests! Cut the foie gras into slices of 1cm thickness. Cut each slice with a round cutter of diameter 3cm & refrigerate. Set aside trimming for the custard. Place a non-stick pan over strong flame. Season foie gras with white pepper & salt. Sear both sides for 30 secs. Remove from pan & place on top of custard later. Place raw foie gras into blender. Add salt, pepper, wine, cream & milk. Blend at moderate speed till a smooth consistency is attained. Add egg, process again at low speed. Pour mixture into a deep serving plate. Place the plate into a bain-marie tray & pour water to level below the plate rim. Bake for 10 mins & remove the plate. Sprinkle paprika, cinnamon & sugar over custard. Torch with a gas lighter & serve immediately. Hope you've enjoyed the cooking demo as much as I did! Head over to Le Saint Julien French Summer Terrine Recipe now to start off your meal! 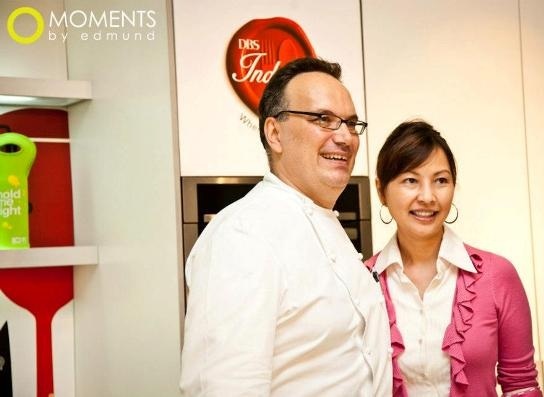 The Masterclass with Julien Bompard was brought to you by DBS Indulge at AFC Cooking Studio. Hong, liver texture is quite different from fish. Well, u can also try it out & let me know. Hahaha! Aki, that's French for duck/goose liver. A pricey item on a restaurant menu. One of my fave must-have items in fine-dining. I'm already salivating!! Hahaha! Smitten ByFood, thks dear! Have a good day! DS, that's nice! Hahaha! Now u can have a better viewing. Enjoy! Shirley, that was a great video clip! I didn't realize the custard was caramelized when you first wrote about it -- now I want to try it twice as much! :) Can't imagine how delicious that duo must have been... so glad you got to meet Chef Bompard and sample his exquisite cuisine. Kim, I glad u've enjoyed the clip! I'm just as excited to try, my dear! Hey, its the same chef who made summer terrain. I checked the video how easily he made the custard with duck liver. Kathy, try this some day! missyblurkit, hahaha! Hard to resist, huh?? Mary, totally on the same page! Hahaha! I'm not as ambitious as u are. Gotta take my hats off u, my dear! this sounds delicious, Shirley! Hope to try it one of these days! Tina, been a while..... Hope u're well!